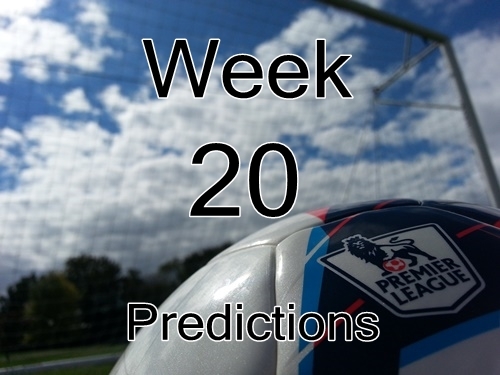 Week 20 Premier League matches will take place to start out 2015. New Year’s Day matches are always fun to watch, even if they do start quite early. Here in the States kickoff for the first game will be at 7:45 am EST, which comes quite early. I will be getting up for this one and intend to spend my morning watching as much soccer as possible. There aren’t a whole lot of massive games being played, but there are a few big matches and plenty of implications for standings in the table. Manchester United travel to Stoke to kick off the day in hopes of continuing their unbeaten run and starting a new winning streak, but it won’t be easy considering the difficulties of playing in Stoke. Sunderland are hoping they can do what Burnley did last weekend and get a result at the Etihad against Manchester City. On the flip side, City will need to make sure they don’t make the same mistakes they made on Sunday. The two biggest matches of the day take place with Southampton hosting Arsenal and Tottenham taking on Chelsea. There are big chances here for both Southampton and Tottenham to take. Tottenham, for their part, will most likely be hoping Southampton and Arsenal play to a draw to give themselves a chance to gain on both teams. Chelsea can further cement their place at the top of the table with another win and extend their lead, but will not find it easy against a Spurs team that is finding its stride. All in all it is looking like another fantastic day of football. There are plenty of teams with something to play for. QPR are hoping they can keep their home form going against a Swansea team that have something to prove after their 1-4 loss to Liverpool on Monday. Crystal Palace, Newcastle United, and West Bromwich Albion all start out the new year with new managers and will be making their own attempts at moving up the table. It should be quite interesting to see how they do. Newcastle have a relatively “easy” fixture against Burnley, but with the way Burnley have been playing lately, this could be quite intriguing. Likewise for Crystal Palace traveling to Aston Villa where a draw would probably be a good enough result considering where they are at right now.